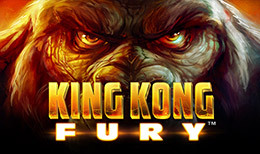 Unleash the Primal Fury of Kong, Triumph in the Battle of the Beasts! 4 ACTION PACKED FEATURES! Win up to 100 FREE GAMES with WILD REEL RE-SPINS. A combination of random features provides constant anticipation and surprises as NextGen takes players back to the jungle where it all began.